Su-kam has introduced one more innovative gadget in its solar product series. “SolarCon” – The name itself tells the application of this product. Yes, it is a solar conversion kit for normal home inverters with single or double battery. Targeting the home inverter market in India, Sukam has introduced this solar conversion kit with most advanced functions compared to other potential competitors. What is Solar conversion Kit? Solar conversion kit is an additional device which could be connected to your existing home inverter to convert it to hybrid solar inverter. 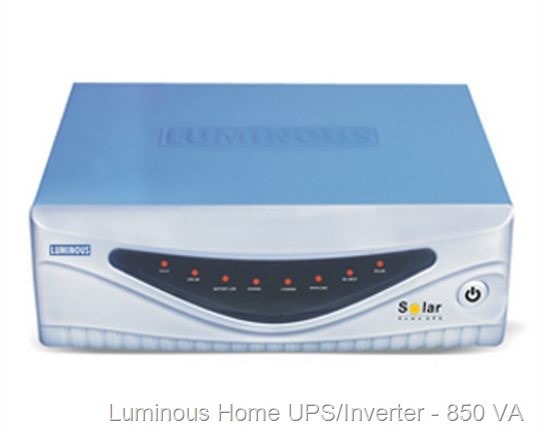 By converting your normal inverter to solar hybrid inverter, you can connect solar panels to it and start using the solar energy available in the day time for your normal home use. Your electricity bill will come down in few months. With solar hybrid inverter, you could handle severe Power cuts in summer. You could handle long power cuts like 12 hours to 15 hours per day easily. But you should install correct ratio of solar panels according to your daily usage pattern. Installing a single 80 watts panel with 800 va inverter and using all your fans, tubes and TV’s won’t help you get the benefit of solar energy. Install 250 watts panels with 800 or 600 va inverter and minimum 135 ah battery. More than 4 million inverters were sold every year in India, this is something huge and we should notice that all these inverters are normal grid powered inverters. We cannot connect solar panels directly to these inverters. There are many Chinese make solar charge controllers are available to convert this normal inverters in to solar inverters, but their functionality is minimal and not innovative, there are some serious issues with these unbranded solar converters. Warranty and service is also a big nightmare with Chinese unbranded solar converters and charge controllers. Sukam has now come up with a branded solution to this problem. Sukam ‘Solarcon’ is built with unique features and comes with sukam warranty. Sukam has a very wide service network throughout the country. It is not just an imitation of any other model available in Europe , America or china. Sukam has patents for the design and technology used in ‘SolarCon’ solar conversion kit. Price difference between non-branded conversion kit and Sukam conversion kit is minimal, go branded! With sukam ‘Solarcon’ PWM 12v 16 amp Solar conversion kit, we can connect up to 260 watts of solar PV modules. SolarCon solar hybrid conversion kit is available up to 48v 40 amp (4 battery system), in which solar PV modules up to 3000 watts could be connected. But it is expensive. PWM is widely used and affordable technology which is inexpensive and suitable for middle class people. MPPT is a choice of people who need more rigid configuration and who want to get most out of the available solar energy. Little expensive too. Priority to Electricity from solar panels to charge the battery, even when the mains power is available. After the battery is fully charged, power for the connected load is supplied directly from solar panels and battery. Pre-defined, user settable Battery limit when using solar power to preserve the battery power and prolong battery life. LCD display – Solar status – Battery voltage – Grid charge status – Amount saved- mains voltage etc.